It’s Monday again, it seems like only a week since that happened. That’s how you start a blog, with a joke that’s not quite good enough to even be a pun. Alright, let’s get into this. No blogging was done by yours truly over the weekend, mostly because the person who shared a womb with me (AKA twin brother Jonathan) is back by my side once more. However don’t let that make you think writing wasn’t done. It was, but we’ll get into that later. First I want to tell you about a game. This game, as yet unnamed, was invented by the very same womb-sharing Jonathan who’s back in the country, the lovely lady Holly, and myself – and was invented almost two years ago to the day, on the Australia day of 2014…which for any potential non-Australians out there in internet land, is January 26th, also, tomorrow. It’s a drinking game/social experiment that goes like this: One person in your group makes a post on their social media site of choice; preferably a post that has a wide audience appeal – with the aim being that each person in the drinking group tries to predict what people in your social circles will like, heart, share, comment, or tattoo on themselves your post. With the canny person taking into account chronic social media users, those who would relate to the post in question, and the type of people who would likely be on social media at the time the post is made. 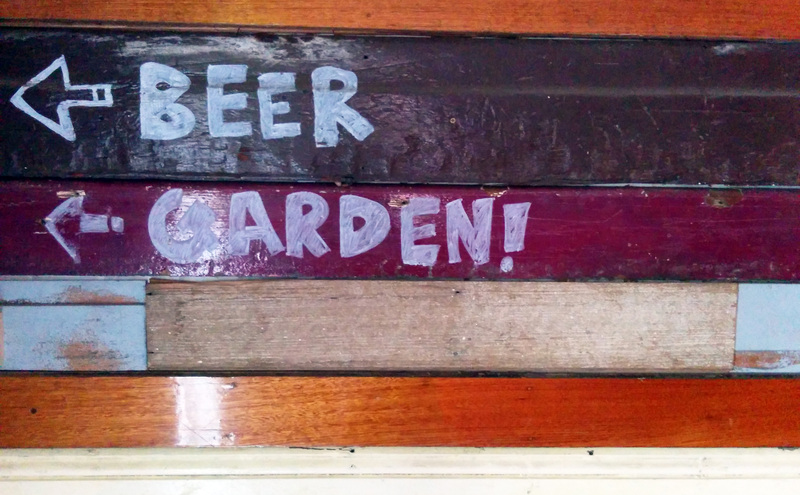 Consequences or rewards of the drinking variety are then set in place depending on who, and in what fashion, people interact with the post. For example, Holly, Jonathan, and myself played this game on the weekend when we went to a bar in Brunswick East called The Alehouse (try their peanut butter and jelly amber ale, it tastes amazingly like rocky road). 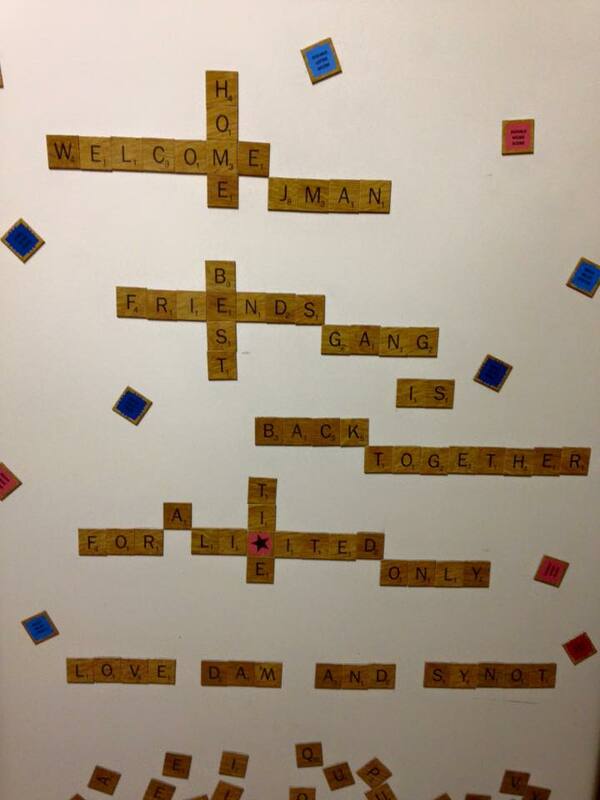 Jonathan posted a photo of a welcome back message Holly had cleverly made for him using scrabble magnets on our freezer (see below). He posted this photo to facebook with the caption “Holly scrabbled me up a welcoming message – it’s good to be back with these two“, making sure to tag Holly and myself in it in order to reach a wider audience. We then each nominated five people who we thought would ‘like’ the post, one person we thought would comment on the post, and a ‘wildcard’; someone we nominate to interact with the post who is a more risky option i.e. someone who doesn’t use social media a lot, sporadically, or who is on the fringes of our social circle but still a friend on facebook – a wildcard. We then agreed upon reward/punishments for each other should one of our people like and/or comment on the post. In this case when one of your people likes the post everyone else has a drink, same if your person comments, and if your wildcard comments you have to take a shot. Throughout the day we even strategically liked or commented on the post ourselves to ensure it stays in the newsfeed cycle, and therefore strengthen the chances of our nominated people seeing it and getting a response. And that’s basically why I didn’t write blog on the weekend. The end results were shameful. I only had one of my people like it. Jonathan got four and Holly got three, and we had no comments. We still managed to drink a lot though. As I mentioned the game is as yet unnamed, if you have any ideas for a name let me know.